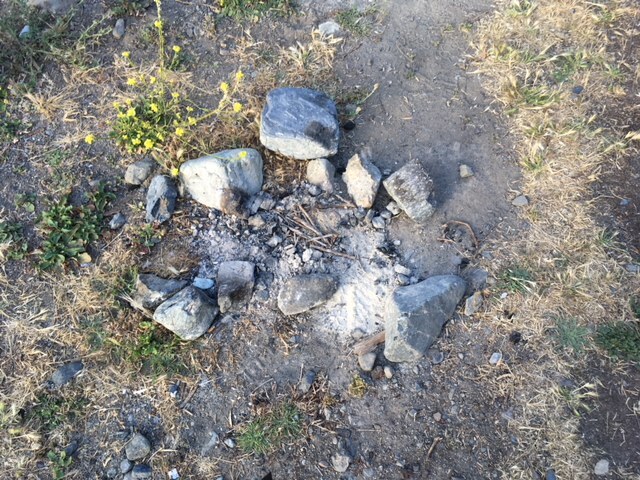 This entry was posted on Monday, June 25th, 2018 at 11:51 am and is filed under Big Sur, Fire, Flood & Apocalypse, Politics, Santa Lucias. You can follow any responses to this entry through the RSS 2.0 feed. You can leave a response, or trackback from your own site. Yes, PMC has been locking ALL their facilities since the kiosk at Sand Dollar was torched. 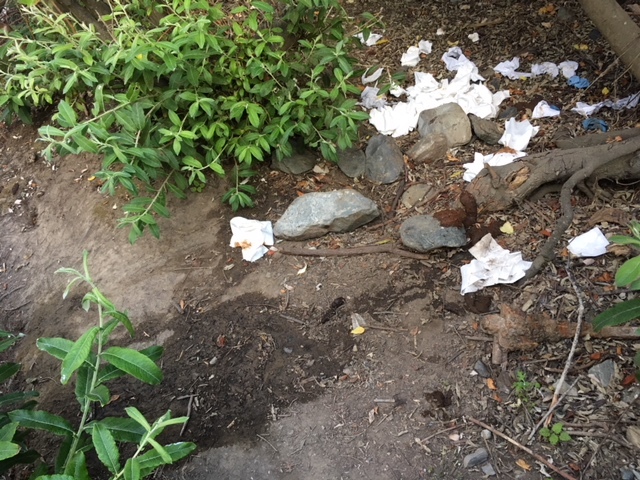 While I can understand the desperation when nature calls, not burying excrement & not packing out/trashing used toilet paper is pretty much unforgivable. Meanwhile, the Monterey County Convention and Visitors Bureau is apparently still advertising to tourists to come here. They are funded in part by most of the townships on the Peninsula. How about they take some of that funding and put it into some infrastructure, i.e. bathrooms? The word is already out about this area. My guess is tons of folks are using social media to tout it’s beauty, therefore a lack of advertising isn’t likely to stop the flow of tourism for a few years and that money would be better spent creating infrastructure (again, public restrooms!). As much as I’ll hate seeing them along the coast, I can’t think of another reasonable or realistic alternative. I’m tired of stopping at favorite places only to be repelled by the human excrement behind every tree. # so is locking up the public restrooms. Which, in the case of Willow Creek, are cinder-block pit toilets. Which tend to be pretty gross. What, they got tired of picking up & putting out fresh TP? PMC is the concessionaire that contracts with the Forest Service to maintain various Forest Service facilities – making their money by charging fees to the public. I don’t know what the provisions of the contract with the Forest Service are and whether it provides that PMC can lock up Forest Service restrooms if their kiosk gets vandalized, but it is the Forest Service that is ultimately responsible for ensuring that adequate provisions are made for public use of their roadside attractions – like the Willow Creek Picnic Area. Travel apps all point to Willow Creek as one of the few places on the coast where restrooms are available. I can think of no justification for them being locked. Alpha Roaming, we used to be very welcoming. We, and more importantly, our facilities are beyond overwhelmed. This is not good for tourists, or residents, or businesses. River Inn’s bathrooms are completely overwhelmed daily, and their septic cannot handle the onslaught. RE: PMC. Not to mention they don’t accept the CA State Parks Golden Poppy annual pass. Not sure how they get away with that but it really pisses me off. Well, because they are not state but federal. They don’t honor each other’s passes, nor are they required too. I want to try my federal access card with them, but haven’t, yet. My mistake. They don’t accept Nat’l Park passes either, granted these aren’t part of the NPS system. Do you know if they honor entrance passes from one to the other of their properties? I seem to remember they don’t. Is there a reason you are not asking PMC directly why 2 of the DUA restrooms are locked? You state you don’t know the provisions of the contract- yet you have made several assumptions here that are completely incorrect, odd that you are not asking the source. 805-434-1996. Good question. The reason I didn’t bother to call PMC (or even mention PMC in my post) was that these are Forest Service facilities which the Forest Service is ultimately responsible for keeping open. PMC might or might not, depending on their contract, share responsibility for this mess (as I indicated in the response to a commenter’s question which you have quoted), but there is no way in which the Forest Service can escape responsibility. Several people on the South Coast did call the Forest Service and, although it took some time to get a response, I understand the Forest Service now says that the problem will be taken care of. If I’ve made assumptions that are incorrect, why not point them out and set the record straight? I have asked directly, and they are looking into this matter, along with the USFS, who I also asked directly. Parks Management & the use of Concessionaires = Private Sector B.S…. You keep contracting away your Public Lands and Public workforce folks, and then expect something besides profit driven messes? The Forest Service and all Agencies trying to manage our Public Lands are hopelessly underfunded and understaffed. At five bucks a pop at Sand Dollar and $20.00 + to Camp – times the many 100,000’s of visitors over 25+ years – let’s have “Parks (money) Management” buy a new kiosk tomorrow and keep the damn restrooms open and clean. The Big Sur coast is overrun by it’s ever increasing visitation and the population growth of California and the Central Coast area. Much of the Forest Service infrastructure on the South Coast dates to the 70’s & 80;s or even older. The Goose that lays the golden egg for Ventana, Post Ranch,, Ragged Point etc is being choked to death. Big Sur is seeing its wonderful cultural heritage and critical ecosystems eroded by the elite business class, tourism promotions, Real Estate prospectors and endless profiteering. Yes the fee shack (kiosk) was torched but that is not the reason why the bathrooms have been locked. The reason the bathrooms have been locked and trash not attended is because PMC Staff have had hostile encounters. The PMC Staff arrives solo and says that these encounters have scared them to the point of not feeling safe to do their jobs. This is a very serious situation. There should be no hostile engagement of PMC Staff. MoCo Sheriff and Forest Service are handling this matter and bathrooms will no longer be locked, they will be maintained, and trash will be removed. Services will resume. Forest Service is working with PMC in doubling up Staff when they go-about maintenance and repair to ensure no one is solo and to ensure PMC is able to fulfill its service per the Special Use Permit (SUP). This SUP is a 10 year contract, effective 11/1/2016 and will term 10/31/26. This contract/SUP is approved by Congress. FS has implemented this concessioner SUP nationwide. Not just Big Sur. Concessioners nationwide now charge at NPS sites Day Use Fee to cover costs of employment, vehicles, fuel, dump fees to haul away garbage and properly dispose, service vault toilets, and perform repairs when necessary. This fee is authorized by Congress. Day Use Hours for Willow, Sand Dollar, Mill are 10 a.m. to 6 p.m.
Day Use Hours are for parking in the Fee parking area and disposal of day use trash (NOT household garbage, NOT RV garbage). Day Use Hours also encompass restrooms being unlocked each day from 10 to 6. Restrooms ARE available to anyone, pay or not 10 to 6. Anyone can park on the highway and access Mill, Willow, Sand Dollar without paying a fee. Anyone can access these locations without paying, but you can’t park in fee parking area. Trash service is a benefit of paying to park. Residents and RVers and #vanlife people must dispose of their trash at transfer stations aka dumps or garbage pick-up. Our public day use are not for our or RV or #vanlife dumping. I’ve mentioned a couple times in this message “Congress” in regards to why we now have fees. This means a change to the Act that implemented the Concessioner Program would be needed if you want to try to eliminate fees. Don’t complain to PMC or FS, write to your Congressperson. I’ll provide links on that later. This message is long enough. Please contact me if you need to inform me of anything. This forum (comments online) does not provide adequate discussion, but it’s the best we have, given our locations and schedules. I just got more corrected: toilets will never be locked. Gates won’t be locked. Example: around 9 or 10 PMC will drive to Fee parking and assess fees for whoever is parked there without the PMC Annual Pass sticker or self-registration paper. So this means my posting 10 to 6 is operating hours. You should have an annual pass and then there are no parking issues. Or park outside the fee area. Gates were locked because someone broke the self-registration fee signs. So someone torched the fee station at Sand Dollar, someone broke up the self-registration fee stations at Mill and Willow and PMC Staff is in a hostile, confrontational situation with Locals, not Visitors. Lastly, Plaskett Campground PMC allows dispersed campers up Plaskett Creek Road to use the Campground toilets, even though they do not have to. The only thing dispersed campers cannot use is the water. Campground water is solely for paying campers within Campground. Acquiring all this information apparently required about 10 hours of calls and research. Thank you Anneliese!!! Thanks for the thanks. Calls and face to face and mostly, research. If anyone wants my 273 pages of notes on this topic (not solely Big Sur, but the history of how we got here) give me a jingle. I cannot see how to upload to WordPress or Facebook comments to share out the info. It’s 273 pages of articles and a law firm slide deck. 1998 Concessions Management Improvement Act. This problem started with local reaction to new fees. “Only Congress can change it.” The fees are here to stay, even if you do either of the following below, but please know that the complaints over the fees don’t go to local LPNF or to PMC. Contact LPNF or PMC if there is confusion over access or issue with maintenance. You can file a complaint with the USDA Inspector General (Forest Service is part of USDA). You can also contact your local congressperson to share your concern over this (now 20 year old) Act. Messaging out to the public of comment periods on proposed changes and where/how to comment is something that could improve. Signage of proposed changes at physical locations is necessary too, not just a press releases or online/use of internet as a medium for notice. I think the only incorrect assumption was “can PMC lock up Forest Service restrooms if their kiosk gets vandalized”. The last time I was up there (I’m only a part-time resident so, admittedly, I’m only there twice a month) I asked some of the employees who said there were other safety circumstances as to why the restrooms got locked, it wasn’t related to the burning of a kiosk, and PMC management was asking the forest service to resolve the problems so they could safely service those areas- it seems like Anna Lisa got the correct answers and I think it’s cool that your blog is covering this so objectively. It concerns me when people pile on to a thread when they don’t have accurate information. A lot of Kate’s posts are completely biased, which is typical for her, she has a right to feel howevet she does, but some of the sheeple take it as gospel, and it’s usually not. Ie. She made a statement that “PMC is locking ALL of their facilities”, which was a completely false statement, it looks like they locked 2. I was just trying to find out what the accuracies were and I think most of the info is out there on your blog now. Thanks for carrying about our coastline. I was told they locked all 3 of their public coastal bathrooms, but admittedly, as I said, I could not drive into Sand Dollar to check it out. Kate, I guess my point is maybe don’t comment on things just because someone “told you” that it happened. That just seems a little irresponsible… as was accurately stated, “Concessioners nationwide now charge at NPS sites Day Use Fee to cover costs of employment, vehicles, fuel, dump fees to haul away garbage and properly dispose, service vault toilets, and perform repairs when necessary. This fee is authorized by Congress” so, let’s all use our voice to address the people that can actually change it instead of finding a scapegoat, unless there’s another motive for the misdirected anger on the coast – Just my thoughts. Shelby, I hear what you are saying, and for the most part, I agree with you. OTOH, this issue is much more complex than has been reported by anyone, including me, and I have chosen to disengage from it. There is no “one-size fits all.” This is a “one side says X” and “another side says Y.” Somewhere between the two lies the truth, and I don’t have the desire to pursue it further. But I thank you for your thoughts.